President Donald Trump’s tax reform proposal would lead to economic growth and bigger paychecks, while being revenue neutral — according to a recent study by Boston University economists. The Trump administration’s “Unified Framework” plan would lead to an increase in foreign investment (due to a corporate tax cut), while also eliminating loopholes. The business portion of the UF plan reduces corporate tax rates while eliminating loopholes. We model the UF plan as a 46.24 percent cut in the marginal effective corporate tax rate, and a 46.24 percent cut in the percentage of corporate tax revenues rebated. 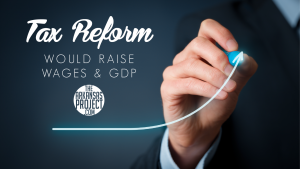 The UF reform is projected to have significant positive macroeconomic effects. A high corporate tax rate reduces the attractiveness of investment in the US. The UF plan’s major reduction in the marginal effective corporate income tax rate – from 34.6 percent to 18.6 percent – induces, in our model, a large inflow of foreign investment. The result is an increase in the U.S. capital stock that ranges from 12 to 20 percent, depending on the year in question. This capital inflow would raise GDP by up to 5 percent, while increasing wages for workers by 4-7 percent. The UF tax reform delivers small increases in lifetime welfare to current retirees and moderate ones to workers and future generations. All generations benefit from the policy. The old benefit slightly from higher rates of return on their investment, and the young from higher wages. A separate study by the White House Council of Economic Advisers released last week found that cutting the corporate tax rate would increase the average household income in the United States by $4,000 annually. The White House has previously said their goal is to pass tax reform legislation before 2017 ends. You can read the full Boston University study here. ← Where’s Our Instrument Panel?